Move oven rack to middle position (remove other racks). Heat oven to 350°F. In extra-large glass or metal bowl, beat cake mix, cold coffee and 1 tablespoon cocoa with electric mixer on low speed 30 seconds; beat on medium speed 1 minute. Pour into two ungreased 9-inch loaf pans. Sprinkle with candy sprinkles. Bake 35 to 45 minutes or until top is dark golden brown and cracks feel very dry and not sticky. Do not underbake. Immediately place each loaf pan on its side on heatproof surface. Cool completely, about 1 hour. Run knife around sides of pans to loosen cakes; remove from pans. Make topping mix as directed on package using milk and vanilla; add icing sugar and 2 teaspoons cocoa for the last minute of beating. 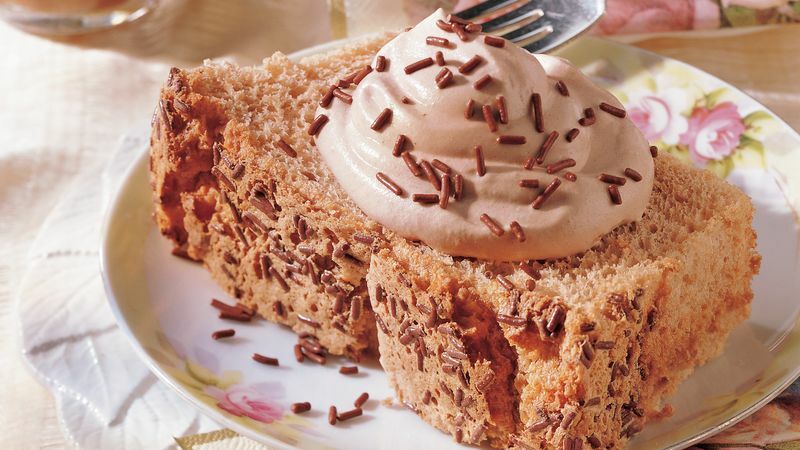 Serve cake with topping. Sprinkle with additional candy sprinkles if desired. Store in refrigerator. Simplify Not able to make the mocha topping? Simply use frozen (thawed) whipped topping instead. It won’t pack a chocolate punch, but the colour will make an interesting contrast to the cake and candy sprinkles. Substitution A traditional angel food (tube) cake pan will also work with this recipe; just follow the package directions for the pan selected.